On June 15, the graduation ceremony for the graduates from the College of Law and Politics was held at the Boya Auditorium. The Deputy Party Secretary of Hebei North University, Mr. Zhang Lianchun, Vice President of Hebei North University, Professor Ren Liang, Party Committee Propaganda Department, Office of Academic Affairs, Student Affairs Office, Youth League, and other related departments leaders attended the ceremony and witnessed the graduation ceremony. All the teachers and students of the College of Law and Politics summing up to 1200 people participated in the ceremony. The solemn graduation ceremony was opened with the national anthem. 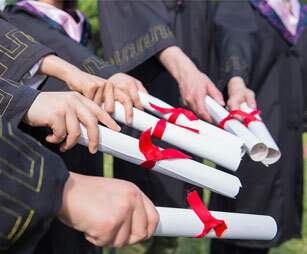 The leaders of Hebei North University presented the degree certificate and graduation certificate to the graduates. The Deputy Party Secretary of Hebei North University, Mr. Zhang Lianchun presented the Honors Certificate to the best teachers. The vice president of Hebei North University, Professor Ren Liang presented the provincial outstanding graduates certificate to the best graduates. The representative for the graduates expressed in his statement, that they’re very grateful to the teachers and will miss this university, and he also said that they’ll study and work very hard in future, and promote the name of their alma mater. The representative for the teachers told the graduates to have a grateful heart and encouraged them as they prepare to embark on a new path in life, to achieve excellent results. The Dean of the College of Law and Politics, Professor Xiao Shouku extended his sincere greetings to all the teachers and graduates. He said in his speech that he wants each of the graduates to learn how to adapt to new learning and working environment and to carefully plan their life. He also stated that the graduates shouldn’t forget their alma mater. A farewell graduation party was held for the graduates after the official graduation ceremony to send good wishes to the graduates. The farewell party was not only filled with blessings and joy but also served as a deep separation and parting for the graduates.